GlassDuo are a uniquely talented pair. 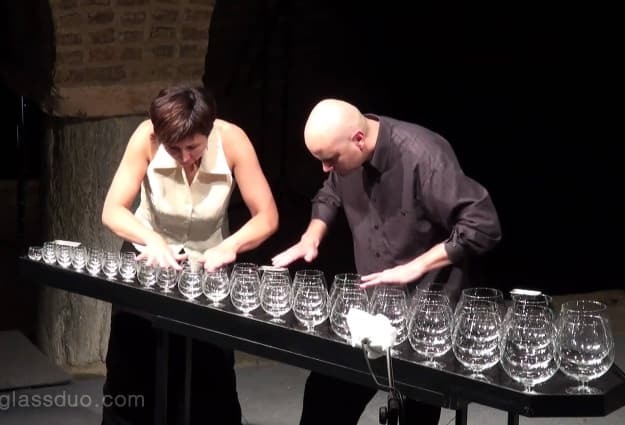 Anna and Arkadiusz Szafraniec formed GlassDuo in Gdansk, Poland when they created their own glass harp from ordinary wine glasses. Watch them play Tchaikovsky’s ‘Sugar Plum Fairy’ here. The Szafraniecs claim their glass harp is the world’s biggest, with a huge five-octave range. Since creating their magical instrument, GlassDuo have toured the world making appearances on television, at festivals and teaching glass harp courses. Both of these tracks are available on their 2015 studio album Glassified. Tags: glass duo, glass harp, Tchaikovsky.